Ever wonder why GM took so long to figure out that whole quality thing? If you have a decent commute or if you’re like me and enjoy listening to podcasts instead of rock music when you exercise then check out This American Life’s story about GM and Toyota. 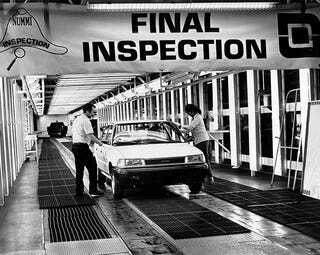 In 1984, Toyota and GM had a joint venture in Van Nuys to open up a new plant: NUMMI (New United Motor Manufacturing Inc.). Toyota showed GM how to make cars with better quality and higher efficiency. At the time, a GM plant looked like a bunch of drunk uncles slapping car parts together. Toyota offered the key to success, but did GM take it? I get made fun of a lot for how much I enjoy podcasts, but I am pretty sure people on OPPO will enjoy hearing this story - including hearing from some of the GM employees that were actually there at NUMMI. Or you can do what I do and download it on your phone. Hope you enjoy listening to it; they do a great job of explaining the history in an enjoyable, story-telling fashion. Toyota Corolla image from automoblog.net - First Toyota Corolla to roll of the NUMMI line.